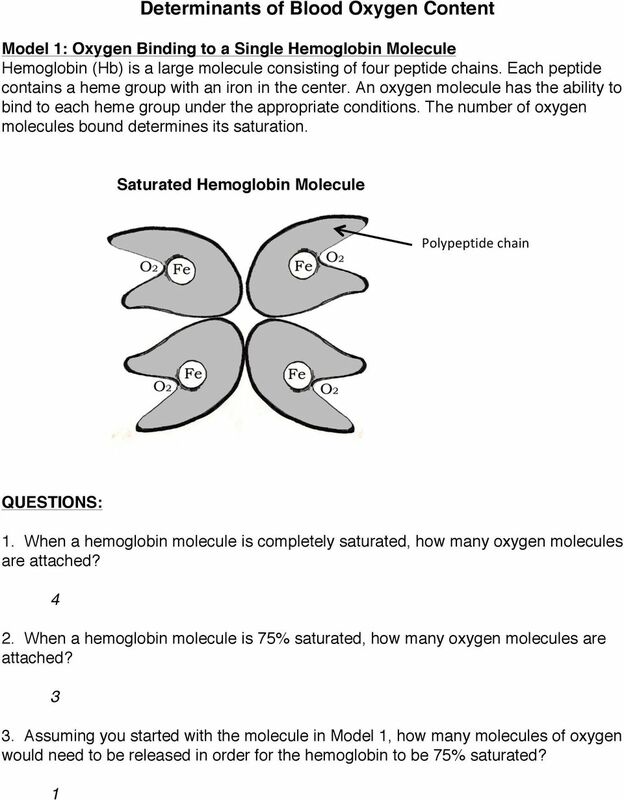 Download "Determinants of Blood Oxygen Content Instructor s Guide"
1 Determinants of Blood Oxygen Content Instructor s Guide Time to Complete This activity will take approximately 75 minutes, but can be shortened depending on how much time the instructor takes to review questions while moving through the activity. 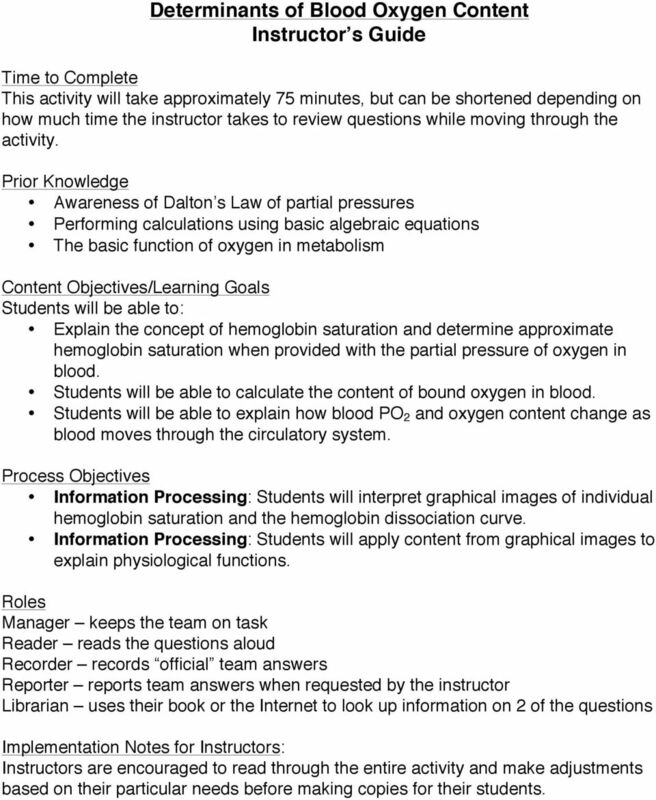 Prior Knowledge Awareness of Dalton s Law of partial pressures Performing calculations using basic algebraic equations The basic function of oxygen in metabolism Content Objectives/Learning Goals Students will be able to: Explain the concept of hemoglobin saturation and determine approximate hemoglobin saturation when provided with the partial pressure of oxygen in blood. 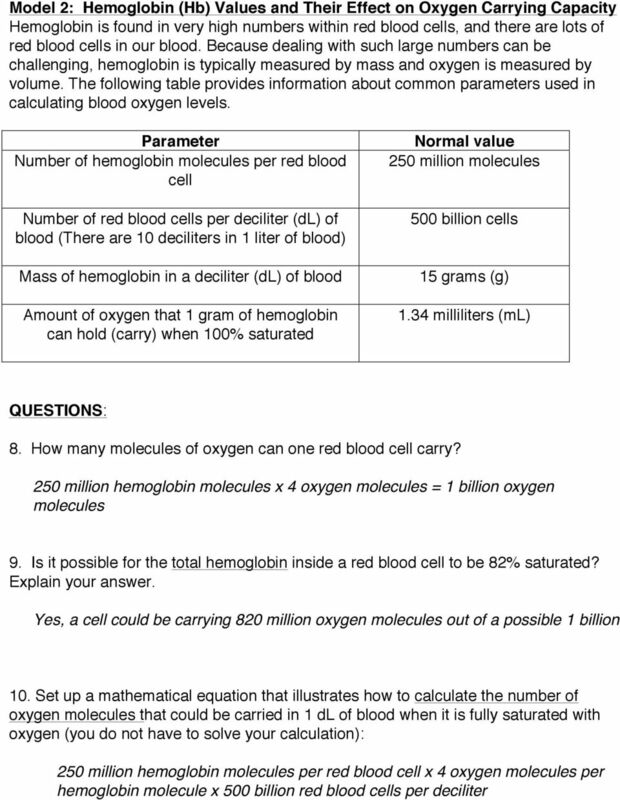 Students will be able to calculate the content of bound oxygen in blood. Students will be able to explain how blood PO 2 and oxygen content change as blood moves through the circulatory system. 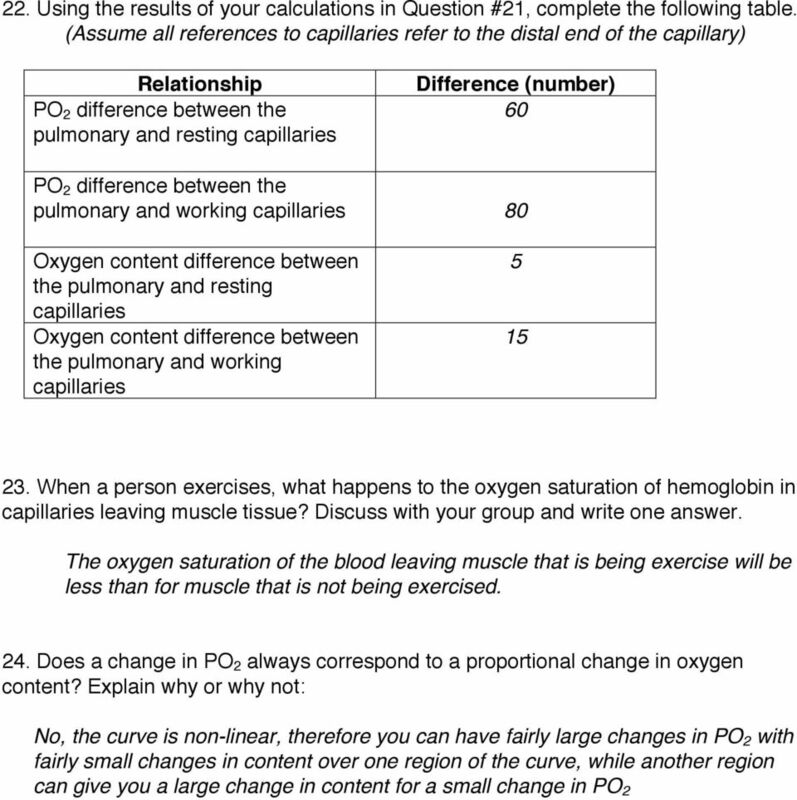 Process Objectives Information Processing: Students will interpret graphical images of individual hemoglobin saturation and the hemoglobin dissociation curve. Information Processing: Students will apply content from graphical images to explain physiological functions. Roles Manager keeps the team on task Reader reads the questions aloud Recorder records official team answers Reporter reports team answers when requested by the instructor Librarian uses their book or the Internet to look up information on 2 of the questions Implementation Notes for Instructors: Instructors are encouraged to read through the entire activity and make adjustments based on their particular needs before making copies for their students. 7 16. What are the units specified on the Y-axis? % 17. 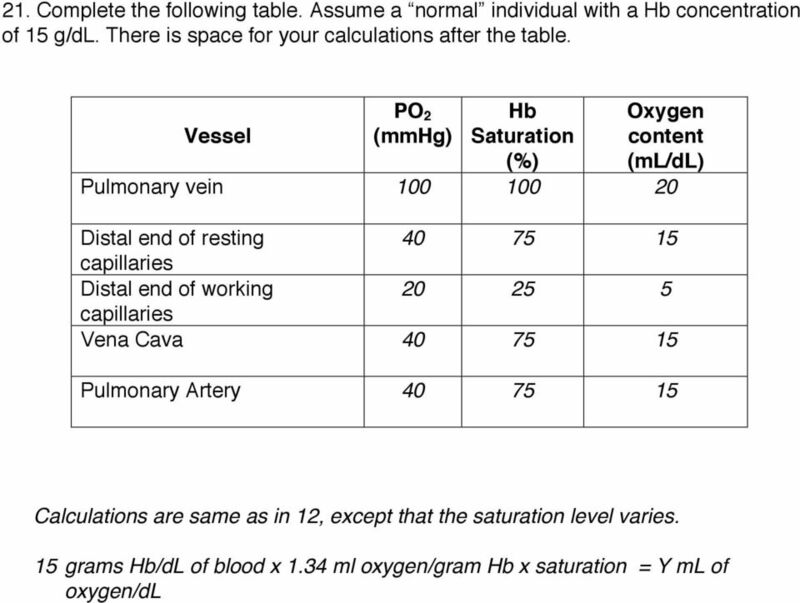 As partial pressure of oxygen (PO 2 ) increases, what happens to hemoglobin saturation? As oxygen partial pressure increases, the hemoglobin saturation increases until saturation is reached 18. At PO 2 of 100 mm Hg, what is the hemoglobin saturation? 98% 19. At PO 2 of 20 mm Hg, what is the hemoglobin saturation? About 25% 20. 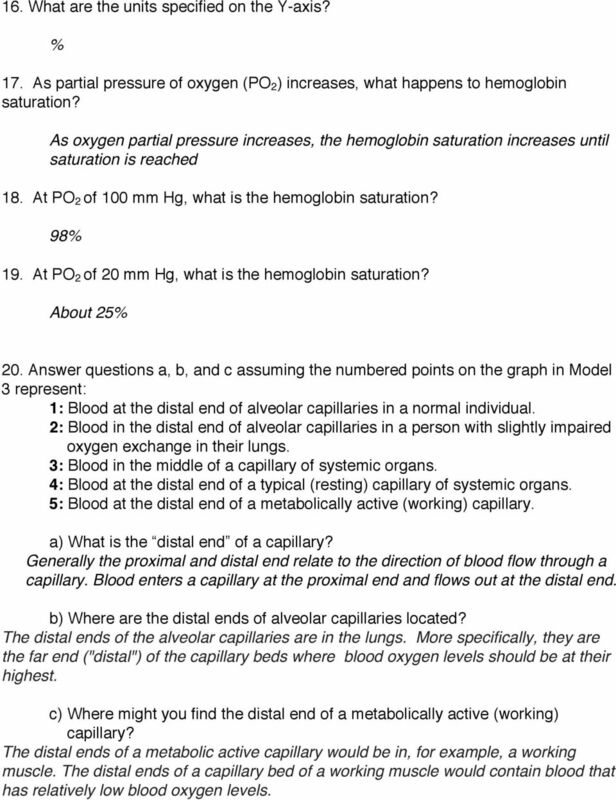 Answer questions a, b, and c assuming the numbered points on the graph in Model 3 represent: 1: Blood at the distal end of alveolar capillaries in a normal individual. 2: Blood in the distal end of alveolar capillaries in a person with slightly impaired oxygen exchange in their lungs. 3: Blood in the middle of a capillary of systemic organs. 4: Blood at the distal end of a typical (resting) capillary of systemic organs. 5: Blood at the distal end of a metabolically active (working) capillary. a) What is the distal end of a capillary? Generally the proximal and distal end relate to the direction of blood flow through a capillary. Blood enters a capillary at the proximal end and flows out at the distal end. b) Where are the distal ends of alveolar capillaries located? The distal ends of the alveolar capillaries are in the lungs. More specifically, they are the far end ("distal") of the capillary beds where blood oxygen levels should be at their highest. c) Where might you find the distal end of a metabolically active (working) capillary? The distal ends of a metabolic active capillary would be in, for example, a working muscle. The distal ends of a capillary bed of a working muscle would contain blood that has relatively low blood oxygen levels. 10 Extension Questions: 25. There is an oxygen bar in town where you can pay to breathe air with higher than normal oxygen content. The owners claim it will improve your alertness and ability to function. Using data from the graph in Model 2, discuss with your group whether you think this statement is true or not. Explain your answer in complete sentences below: The claim is untrue because under normal conditions hemoglobin is 98% saturated 26. A person with anemia has a decreased concentration of hemoglobin in the blood. 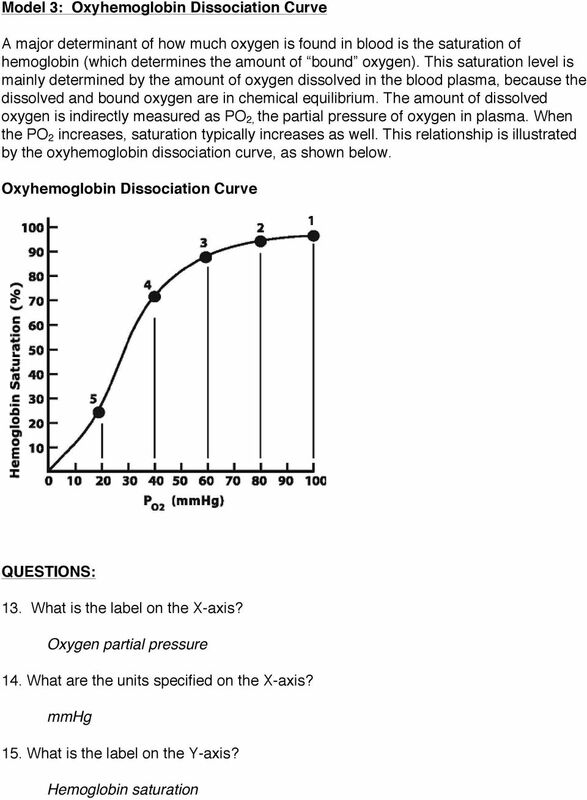 a) Would this affect the person s oxyhemoglobin dissociation curve? Explain: It would not affect their curve, as it only shows the relationship between PO 2 and saturation, not the relationship with PO 2 and content. b) Would it affect their blood oxygen content? 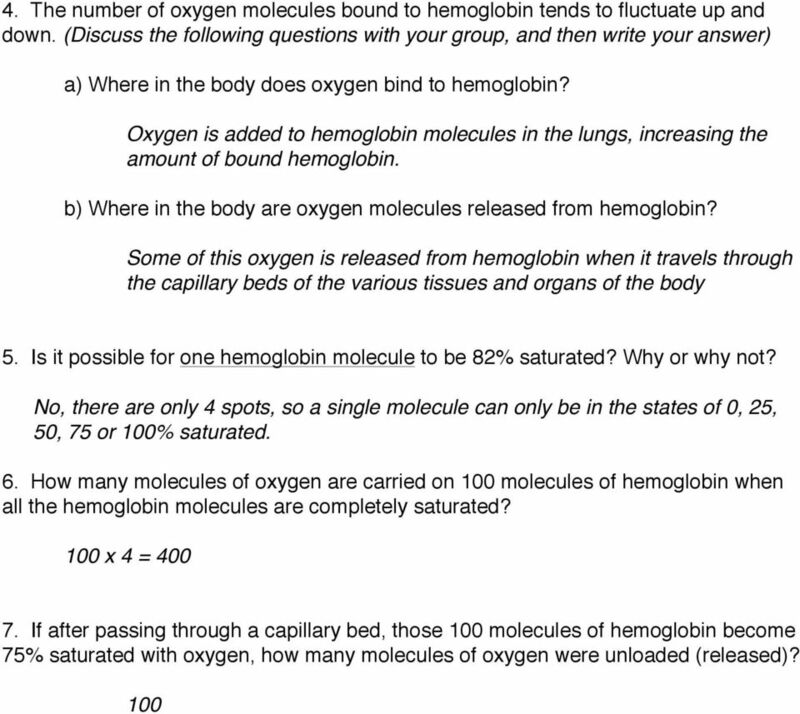 Explain: A decreased concentration of hemoglobin would reduce the ability of the blood to carry oxygen due to a reduced number of hemoglobin molecules. 27. 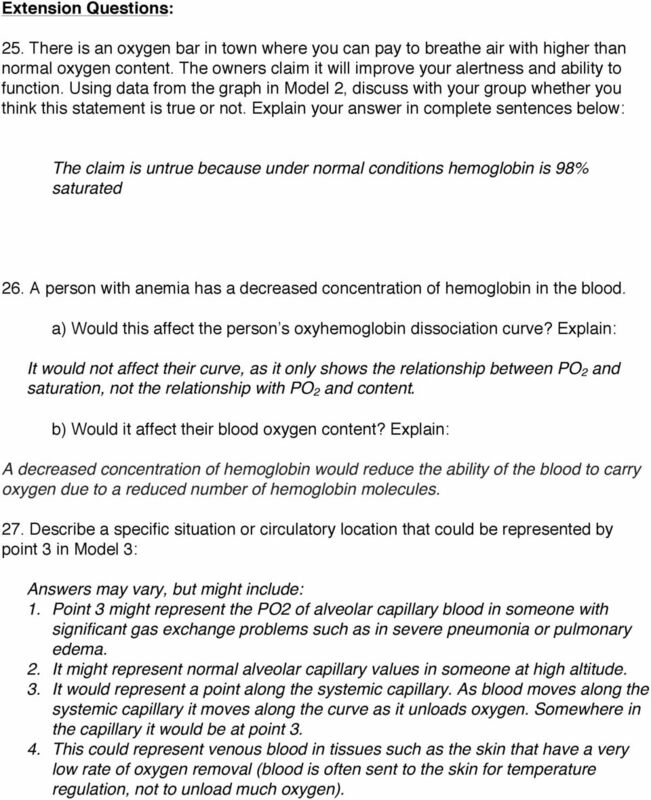 Describe a specific situation or circulatory location that could be represented by point 3 in Model 3: Answers may vary, but might include: 1. Point 3 might represent the PO2 of alveolar capillary blood in someone with significant gas exchange problems such as in severe pneumonia or pulmonary edema. 2. It might represent normal alveolar capillary values in someone at high altitude. 3. It would represent a point along the systemic capillary. As blood moves along the systemic capillary it moves along the curve as it unloads oxygen. Somewhere in the capillary it would be at point This could represent venous blood in tissues such as the skin that have a very low rate of oxygen removal (blood is often sent to the skin for temperature regulation, not to unload much oxygen). Chapter 1 Dissolved Oxygen in the Blood Say we have a volume of blood, which we ll represent as a beaker of fluid. Now let s include oxygen in the gas above the blood (represented by the green circles). Gas Exchange Graphics are used with permission of: adam.com (http://www.adam.com/) Benjamin Cummings Publishing Co (http://www.awl. Explain what produces this difference in pressure. How to Read SpO 2. Basic understanding of the pulse oximeter. Konica Minolta Sensing, Inc. Kinetic Theory of Gases. 6.1 Properties of Gases 6.2 Gas Pressure. Properties That Describe a Gas. Gas Pressure. Learning Check. Chapter 6 Gases Kinetic Theory of Gases 6.1 Properties of Gases 6.2 Gas Pressure A gas consists of small particles that move rapidly in straight lines. have essentially no attractive (or repulsive) forces. Provincial Exam Questions. 27. Which of the following engulf foreign substances in the blood? 1. Of the following, which is NOT involved in pulmonary circulation? a. Coronary Artery c. Right Ventricle b. Left Atrium d.
1. Of the following, which is NOT involved in pulmonary circulation? a. Coronary Artery c. Right Ventricle b. Left Atrium d. Pulmonary Vein a. CORONARY ARTERY 2. The heart of a human contains chamber(s). 1. Primary function: uses hemoglobin to transport oxygen. The heart, blood vessels, and blood together make up the Circulatory System. Oxygenation and Oxygen Therapy Michael Billow, D.O. Activity 4.1.1: Path of Blood in the Heart Introduction At the time of her death, Anna s heart stopped beating. The body s pump was no longer able to propel oxygen-rich blood to her tissues and cells. Chapter 16 Human Circulatory System Transport Involves the absorption and circulation of materials throughout an organism Human Circulatory System Closed circulatory system- blood is always in blood vessels. (2) Which of the two proteins binds the ligand tighter? Explain your reasoning. Biology I Ms. Chen Name: Date: Circulatory System Quiz Directions: Circle the best answer. Multiple Choice (2 pt each) 1. Laboratory tests can be used to evaluate how well a person s liver is working. Rules on Oxygen Therapy: Physiology: 1. PO 2, SaO 2, CaO 2 are all related but different. 2. PaO2 is a sensitive and non-specific indicator of the lungs ability to exchange gases with the atmosphere. 3. 1 The diagram shows blood as seen under a microscope. Which identifies parts P, Q, R and S of the blood?